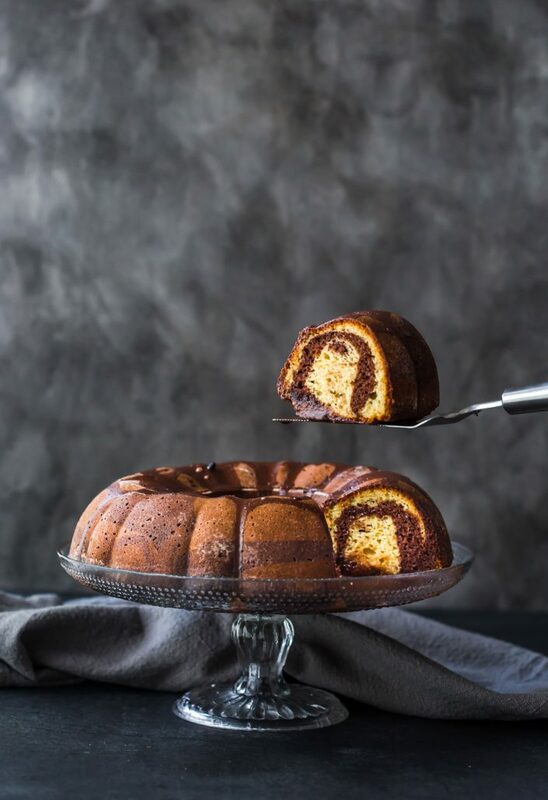 Marble Bundt Cake! How beautiful is the inside of this cake?! Absolute perfection! 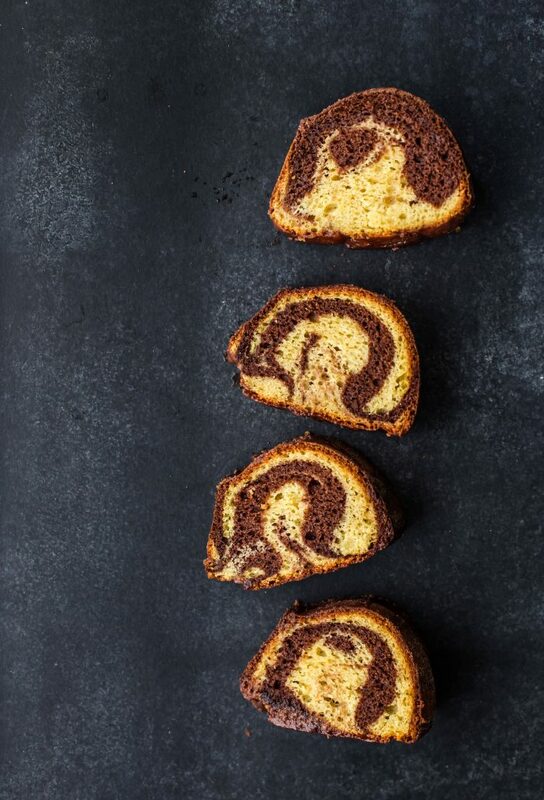 It’s really quite simple to create the marble effect in this cake. All you have to do is alternate your scoops of the original cream batter and the chocolate batter. I didn’t swirl mine together at all, just left them as I scooped them in and it worked incredibly well. This is my favourite gluten free cake recipe and I simply turned the cream batter into a vanilla flavoured cake, removed half of that batter and mixed through a couple of tablespoons of cocoa powder and that’s how you get the chocolate coloured batter, simple! 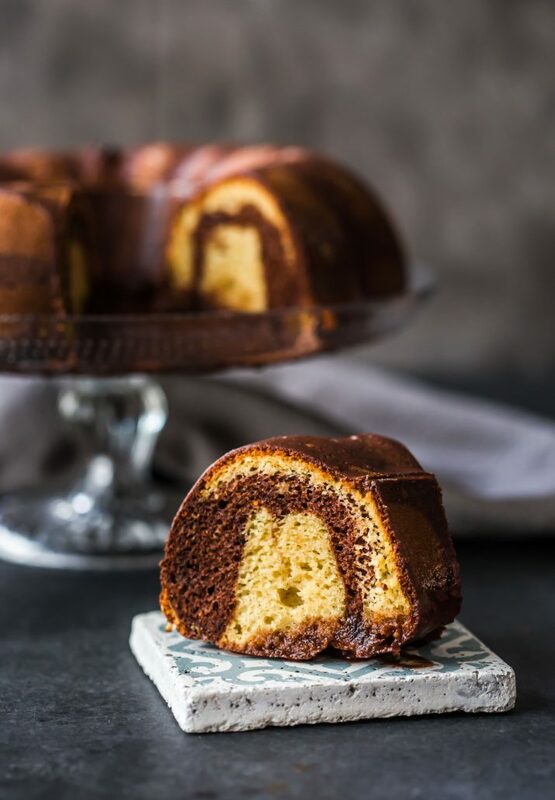 Hope you enjoy this delicious marble bundt cake, it sure is a showstopper! Preheat oven to 180ºC (356ºC). Prepare a large bundt cake pan (see notes). Melt butter first and then set aside to cool to room temperature. In a large mixing bowl, combine flour, baking powder, sugar, milk, eggs and vanilla. Using a hand mixer, or a stand mixer fitted with the paddle attachment, beat the mixture for 1 minute on medium speed. Scraping down the sides when needed. In a separate mixing bowl, pour out half the batter. Into that second bowl of batter, gently fold through cocoa powder until well blended. 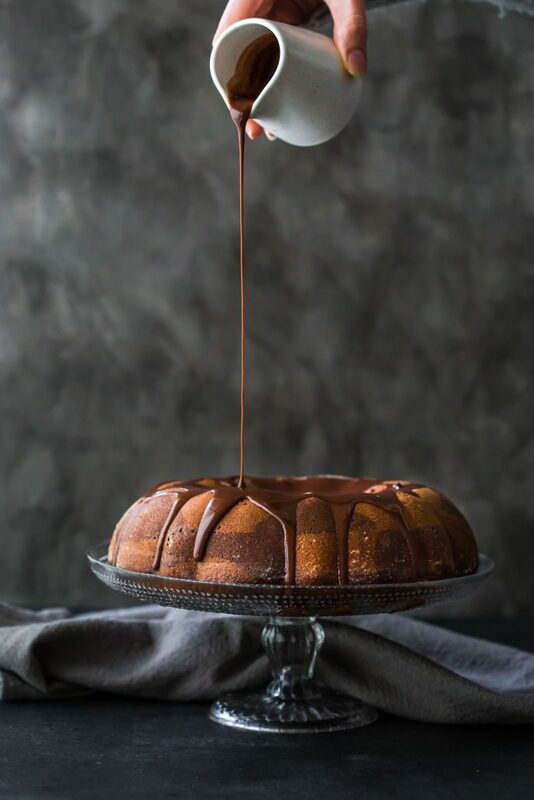 Using an ice-cream scooper or a regular spoon, place 4-5 scoops of the vanilla batter around the base of your prepared bundt pan, leaving gaps between each scoop. In those gaps, scoop some of your chocolate batter, you’re alternating between the two flavours. Repeat this method with remaining batters. Bake 40-55 minutes or until a skewer inserted into the middle comes out clean. The cake should be set and spring back when gently pressed. Remove and cool in pan for 15 minutes. Remove cake from pan by turning it over onto a wire cooling rack. Tap on pan slightly to help remove the cake. In a medium sized bowl, add icing sugar and cocoa powder. Gradually add water, 1 tablespoon at a time, mixing well after each addition until the icing is smooth and thick. Keep adding more water until you reach a thick icing consistency. Once cake has cooled completely, drizzle over chocolate icing. Prepare 1-2 tablespoons of melted butter. Using a pastry brush, dip it into the melted butter and brush the entire inside of the bundt pan with a thin layer of the butter. Pour a small amount of all purpose flour directly into the pan, approx. 2 tablespoons and shake the powder around the pan so it sticks to the butter and the entire inside of the pan has a thin layer of the flour. Shaking out any excess flour. Don’t forget the centre pole in the pan! Store in an airtight container, in the pantry or refrigerated, for 3-5 days. Any thoughts on attempting this beauty with flax or chia “eggs”? Holy delicious. This looks SO good, and it’s so darn gorgeous too! So perfect for the holidays! The cake looks SO good! I tried the recipe and its just so easy. I felt the cake was a little chewy, Can you please tell me what I could’ve done wrong? Also, the batter was quite liquidy, is is supposed to be like that? I used regular flour.